Socially acceptable, but biblically wrong. Follows tradition instead of Truth. The problem is not really the problem. We don’t believe the Bible. We don’t know the Bible. Most of our problems are spiritual problems. The main reason we have so many spiritual problems is because we don’t have an Ultimate Authority. God’s Word has to be the Ultimate Authority or there will be no real authority. The government is only a reflection of the people. All sin starts when men and women think they are smarter than God. 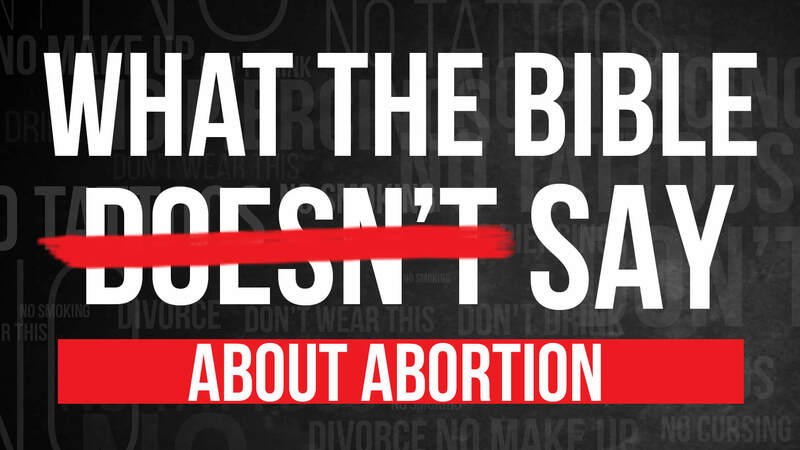 What the Bible says about abortion; What the Bible really says about life. We are to show mercy gentleness, and kindness to those who have had abortions. Teach the truth to our own families and church families. Get involved in changing the laws or making a stand for the right laws. No one can honestly deny the devastation caused by abortion on demand. It is a serious thing to choose to take another human life, especially when that person is your own flesh and blood. True, some argue that a fetus isn’t a person until birth occurs. However, Scripture suggest the opposite – that life begins at conception. The biblical account of Jesus’ conception, period of gestation, and birth certainly give credence to that: “You will be with child and give birth to a son, and you are to give him the name Jesus” (Luke 1:31). Add to that the statement made about Elizabeth in the same chapter: “When Elizabeth heard Mary’s greeting, the baby leaped in her womb” (Luke 1:41). Notice that it doesn’t say, “the fetus leaped in her womb,” or “a blob of tissue leaped in her womb.” It says, “the baby leaped” for joy. Some forty times Scripture refers to conception as the genesis of life in the womb of the mother. Probably the most conclusive Scripture on this subject comes in God’s remarks to Jeremiah, the prophet: “Before I formed you in the womb, I knew you. Before you were born, I set you apart.” (Jeremiah 1:5, emphasis added). The Lord unequivocally states that Jeremiah was Jeremiah long before birth. God knew exactly who he would be from the start. He was a person long before God finished fashioning his body. Understand that God isn’t ‘picky’ with His pardon. Nowhere in Scripture does it say God has a sin manual at His fingertips, which classifies some sins as wicked and others as terrible, horrible, or just plain bad. No, sin is sin in the eyes of God. But His grace covers a multitude of transgressions. While the consequences may vary from sin to sin, the guilt that comes from, say, coveting doesn’t differ from the guilt of lying, stealing, or unrighteous anger. Understand the true nature of a loving God. matter how low we stoop, how horribly we sin, our sin will never be greater than God’s grace. (Romans 5:20) That promise isn’t intended to be a “license” for us to go out and see how much we can sin, so God can use His endless supply of grace. It is intended to reassure you and me that when we fail, do something foolish, or fall into the worst sin we can think of, there is an inexhaustible supply of divine grace to cover our sin. Remember, God has forgotten your past sins and He wants you to forget them, too. We used to sing a chorus years ago that went like this. If God says you’re forgiven, and He has agreed never to bring up that sin again, then believe him – you are forgiven! If He won’t bring up the sin, why should we? To do so is to doubt His Word. God would have you now minister to others anguishing over the same guilt you once experienced. Because of what the Lord has done in your life, you’re in a unique position. Study God’s Word and make yourself available to help others.